The USS STERETT (CG-31), a Belknap-class guided missile cruiser, was commissioned on 8 APR 1967, as guided missile destroyer leader DLG-31. USS STERETT was named for Andrew Sterett (1778 - 1807), the commanding officer of the schooner USS Enterprise during the Quasi-War with France (1799) and in the Barbary Wars (1800-03). STERETT was built by Puget Sound Naval Shipyard in Bremerton, Washington and sailed on her first West Pac with a destination of Vietnam in June 1968. She continued deploying to the Far East through out her career. In 1983 STERETT was involved for the search for Korean Air Lines Flight 007 that was shot down by the Soviets off of Sakhalin island. 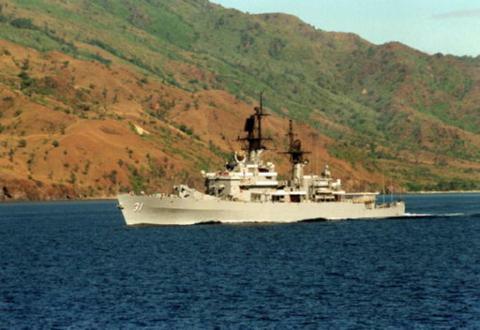 USS STERETT served her country for 26 years, 11 months and 16 days, until decommissioned on 24 MAR 1994. The hulk of the STERETT was scrapped in 2005.